Learning the triggers leading to an autism meltdown is pivotal information. 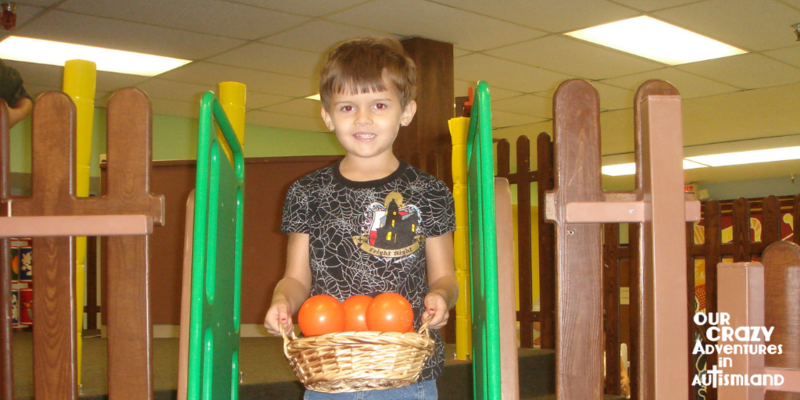 It can be the difference between a good day and an autism rising day. It is as important as learning the difference between a meltdown and a tantrum. When Logan was a small boy with autism, meltdowns were inevitable on a daily, sometimes hourly, basis. One of the first things we needed to work on was to eliminate or at the very least learn how to deal with these near constant meltdowns. We didn’t call them tantrums because they really weren’t . He wasn’t acting like a spoiled brat although he probably looked like one. A meltdown is something he can’t avoid and has outside factors whereas a tantrum can be developmentally appropriate .We weren’t aware of the warning signs of meltdowns. Once he was in meltdown mode, it was game over. No one, including Logan, wanted to see that happen. What does a meltdown look like? What we did was not ground breaking. It was born out of necessity. We had to learn how to deal with the meltdowns as well as what triggered them. Our epiphany was that the time to learn this was not when we were out in public or the only one taking care of him. A run to Target alone with Logan was not the time to learn how to manage a meltdown or how to curb one before it started. The time to do it was at home where we could keep him and us safe. To do this, we did certain things to try to trigger a meltdown. Yes, you read that correctly. We wanted him to have a meltdown. We did this purposefully with an agenda. One of us took notes on what the trigger was as well as what worked to redirect him. Sometimes we would video the encounter so we could scrutinize it later. We tried this many times using many different redirection techniques. Not all of them ended successfully but we learned something that would ultimately help Logan in every encounter. All of this information went into our notes. We took turns attempting different scenarios with corresponding recovery techniques. We all felt safe in our home trying new ways to engage with him in addition to learning invaluable information as to how to make our outings a success. For the record, we did not simply sit around and torture him. Every single interaction ended with redirection to something he loved and down time. The information we obtained from these experiments proved life changing. It told us things that bothered him. When we were pressed for time or out alone, we knew, in advance, that certain things would set him off. If we could, we avoided those triggers to avoid the meltdown. Logan didn’t enjoy melting down any more than we enjoyed dealing with them. When we couldn’t avoid them, we took measures to alleviate them as best we could at the time. Sounds too easy, doesn’t it? I knew that the florescent lights in Publix drove Logan crazy. It put him in sensory overload every single time. If I was in a hurry or needed to buy a lot of groceries, I made plans to go without him. There were times when I couldn’t do that so I learned how to gauge when he had met his sensory limit then call the trip done. I also learned how to redirect him long enough to check out. I learned all of these techniques earlier in the safety of our home. How can you apply this to your child with autism? My advice to newly diagnosed parents is to take the time to learn how to handle a meltdown at home. Learn it purposefully. I know it sounds mean but set off your child and try to handle it until you find out what works . Do it until you are comfortable handling the meltdowns . More importantly, do it until you know all the triggers to avoid. All that info will be a lifesaver later. Above all, remember that the meltdowns are your child’s reaction to a confusing world. It doesn’t define your child. It’s not their fault and says nothing about your parenting ability even if onlookers think otherwise. Take the time to put in the work to help everyone but most importantly, your child. You will never regret learning the answers. That is all so true! 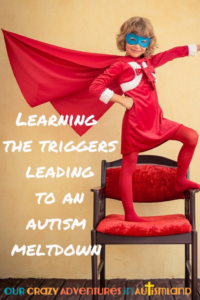 My son is 4 and has Asperger’s and we’ve spent the last year learning what will trigger a meltdown and how to avoid it. They have lessened quite a bit but we do have to stay focused to his needs when we are out. That really is forward thinking, Penny, to go through it all in the safe place of your home and not in the heat of the moment. Resounding applause here. I’ve enjoyed catching up with you. Amen! As a parent of newly diagnosed child , this is interesting . Don’t know if I’m brave enough yet to try and trigger a meltdown but it’s certainly good advice to monitor it at home so you can be better prepared for outside the home. For me though , just knowing that his meltdowns are caused by autism and not naughtiness is a total eye opener . Oh yes! Knowing that is half the battle. You will learn the triggers as you go as well. You are braver than you know!